Japan ha an extremely efficient public transportation system. Train and busses service a large network, especially in metropolitan areas and between cities, and are clean and punctual. Most trains and train lines in Japan are owned by Japan Railways (JR). However, others are owned by a number of private companies, often sharing mutual tracks. 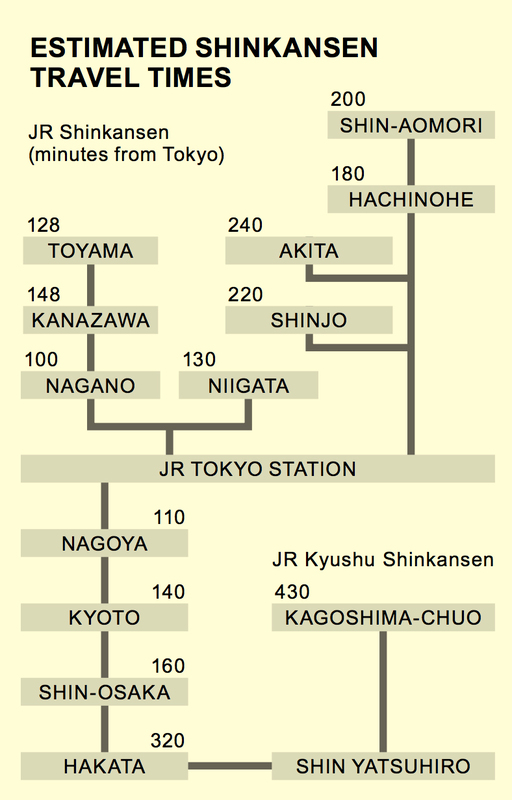 The urban train systems comprise of shinkansen (bullet trains), limited express, express, rapid and local trains. Many are owned by separate companies, so it can be a little confusing. It’s a good idea to carry a route map (called rosenzu) with you at all times. You can pick one up from most train stations. All individual tickets (including shinkansen, private railways and subways) can be purchased from vending machines or ticket offices. Individual ticket costs will be shown on the railway line map next to your destination station. Once you have checked the price, you can buy your ticket from one of the nearby vending machines. Children aged six to 11 pay half price and children under six travel free. Trains owned by different companies require different fares, so prepaid integrated-circuit (IC) cards such as pasmo and Suica, are a useful way to simplify the system (see box). passengers tend to form queues while waiting for the next train. Suica and Pasmo are rechargeable, prepaid integrated- circuit cards that can be used for all buses and trains (except shinkansen), regardless of the operating company. Suica or Pasmo cards can be purchased and recharged at rail vending machines and ticket counters in Tokyo. The initial cost consists of a small refundable deposit plus an initial loading of ¥1500 (for Suica) or between ¥500 and ¥9500 (for pasmo). When riding the train, touch the card to the card reader when you pass through the station’s ticket barrier. The applicable fare will be automatically deducted at the ticket gate at your destination. When riding the bus, touch the card to the reader when you board. If you are required to pay when alighting, make sure you touch your card to the reader when you get on and again when you get off for the appropriate fare to be deducted. The JR pass allows unlimited travel on JR-owned trains, buses and ferries for periods of 7, 14 or 21 days. JR passes are available outside of Japan (either online or through your travel agent) before your visit. See www.japanrailpass.net for more information. Many bus routes link train stations and residential areas. Each stop is announced and displayed on an electric signboard on approach. push the button to alert the bus driver when you wish to alight. Tickets are purchased upon entering the bus, or when getting off, depending on the bus company and the bus route. Fares can be pre-paid or you can use cash or integrated- circuit cards (Suica or pasmo) on the bus. *It is considered bad manners to talk on a mobile phone in trains and buses, so they are best left switched off or muted. The JR East pass provides tourists with unlimited travel on JR trains (including shinkansen and limited express trains) on 72 lines in the Kanto, Koshinetsu and Tohoku regions. passes are available for five or 10 consecutive days or four flexible days within one month.